Surely you have already heard of dozens of reasons why people stop eating meat. Some do it to save the animals, others to save the planet, some don’t like the taste of meat. 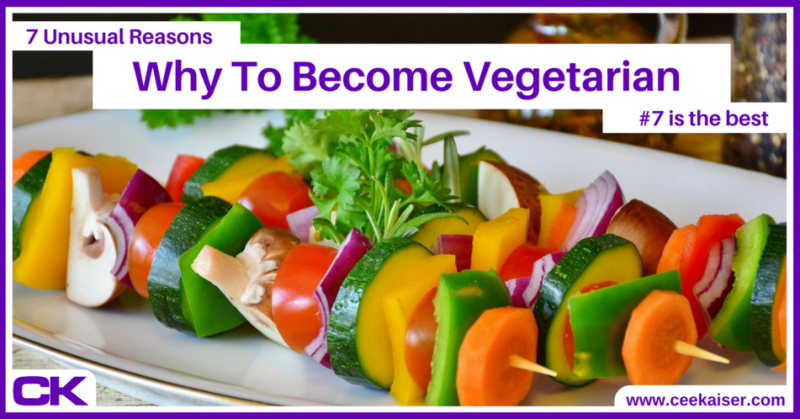 Hence, this article focuses on rather unusual reasons why to become vegetarian. In case one or two of these ideas do appeal to you, give it a shot. Never try, never know, right? Note: Should you be vegetarian yourself already, this article provides good arguments to encourage your friends to follow your lead. Share it with them! Becoming vegetarian yields a mountain of well-known benefits, such as smaller ecological footprints, the possibility to grow more food for more people and the chance to save some endangered animal species. Yet, a lot of people struggle to give up meat. Don’t get me wrong: Eating meat is not a bad thing. We wouldn’t be on top of the food chain if we were meant to eat nothing but vegetables. The issue arises from eating too much meat, which is neither healthy for humans nor for the planet. As deep down we all know that, this article provides new food for thought by offering rather unusual reasons why to become vegetarian. Whether that completely turns people away from meat, or at least inspires some part-time vegetarians (see last paragraph), or maybe has no effect at all, is entirely up to you, my dear reader. Either way, I’d be more than happy to hear from you in the comments below. A) whether the article had any effect on you, and B) which of the reasons you find the most compelling. Being vegetarian saves you a ton of time. Have you ever eaten out in a normal restaurant as vegetarian? The majority of options contain meat, so you can skim most of the menu in seconds. Once you’ve found the handful of vegetarian options, making up your mind is a whole lot easier than for meat eaters. You won’t get bogged down with analysis paralysis. Same applies to shopping groceries in a supermarket. Despite in most supermarkets meat may not have the upper hand, it still saves a lot of time to simply skip the meat aisles. In case you’ve ever heard of decision fatigue, you’ll be grateful to save your decision-making energy for more pressing matters. Tip: Save even more time with these top outsourcing websites or by ditching your phone. Due to saving time and suffering less from decision fatigue, vegetarians are more productive. In addition to these two reasons: Have you ever experienced the desire for an after-lunch-nap after eating a hearty steak? It results from your body being busy digesting the meat. And while perfectly normal, it certainly doesn’t help your productivity. Next time have a salad or cooked vegetables for lunch. Can you feel the difference? Tip: If you love being productive, you will love these productivity hacks. Note: You do look amazing already. You really do. So probably this argument is irrelevant for you. But it is relevant for me, hence I decided to list it nonetheless. Since I became vegetarian in January 2018, I look a lot hotter. I haven’t changed my workout routine (which workout routine?) or discovered a magical pill. Yet my stomach is flatter, and those few muscles I built up over the past 30 years look more toned, more defined. Don’t ask me why, as I honestly cannot tell you. Should you have scientific evidence why this is, let me know. Until then, take my word for it. Possibly not the most unusual reason why to become vegetarian, but not eating meat saves you a lot of money. Compare the prices in a restaurant for a standard meat dish vs. a vegetarian dish – the latter are often 20%-25% cheaper. Then do the same at your local supermarket. Read more on saving and making money. Becoming vegetarian increases your self-confidence, as you always have to ask for things ‘your way’. Do you have vegetarian food here at the restaurant? Can we buy some vegetarian options for the BBQ party tonight? In addition, being vegetarian is inspiring to others. Without trying to evangelize anyone, I have several friends who suddenly turned vegetarian as well. Simply by watching me eating healthy food and feeling encouraged to try the same. Whether they always wanted to become vegetarian but didn’t dare to say, or now had easy access to vegetarian food options and hence gave it a shot, doesn’t matter. Inspiring others always is a boost for your self-confidence! Have you ever had a conversation end with the words “I’m vegetarian.”? I haven’t. For some reason, whenever you state you are vegetarian, people will start asking why, since when, and how it feels. I never heard anybody ask “Why do you eat meat? How does it feel?”, but once you’re vegetarian people will ask questions. Try arguing with any of the unusual reasons of this article, and evaluate the different reactions. My favorite response is the argument below. The potentially most controversial reason why to become vegetarian: Snorkeling and diving is way more fun! As fish aren’t food any longer (remember ‘Finding Nemo’? ), you feel like splashing around in the ocean with finned friends. And somehow these animals seem to sense you’re a friend. During my last snorkeling trips, the fish came a lot closer, one of them even nibbling at my feet. I swear one of them even smiled at me. They also are a lot more relaxed around you – one squid couple decided to get it on while I was watching. Surely fish (as other animals) have an instinct whether you are a threat to them or not. And vegetarians clearly aren’t. If you see no other reason why to become vegetarian, try it at least for the mind-expanding effects. They’re awesome! Haha. In case you found one or several of the above reasons convincing, and are thinking about becoming vegetarian yourself, but aren’t sure how: As ditching meat completely from one day to the next is extremely tough, start with going meat-free on Mondays for a month. It helps to increase your awareness, and you can decide for yourself whether you feel better with or without meat. Once Mondays are meat-free, add a second day, then a third. You’ll be vegetarian in no time. Important: As with any project, if you’re serious about it, start today. Don’t wait for the next New Year’s Resolutions or ‘the perfect date’ to start. Start today!